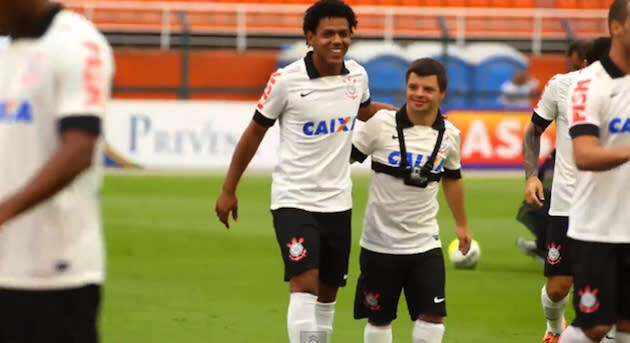 March 21 is World Down Syndrome Day and to mark the occasion, Brazilian giants Corinthians signed 26-year-old Caio Tadeu Batista, a member of the Brazilian national futsal team for athletes with Down syndrome. Caio started the day by meeting his new teammates, then he collected his gear and took part in training both on the pitch and in the gym. After putting in his work alongside the other players and finishing the session with a penalty kick, Caio was presented with a custom shirt and gave a press conference. But this was only the beginning. Two days later, Caio donned his full kit and lined up with the 2012 Club World Cup winners for their Campeonato Paulista match against Atletico Sorocaba. He was with the starting XI for the pre-match handshakes and showed off his skills in warm-ups. After huddling up with his teammates, Caio took the ceremonial kick-off. As he exited the pitch to a round of applause, he clapped for the crowd, took a few bows and made a heart with his hands. Corinthians went on to win 3-0 with a hat trick from Romarinho. And that's why they call Corinthians "The People's Club."